The changes to tax rules on split income and passive income have accountants and advisors inquiring about individual pension plans (IPP). Since 1991, owner-managers who are “connected persons” (in general terms, someone with at least a 10% ownership interest in the employer corporation, or related to the employer) have again been able to establish IPPs. The plans recognize up to 28 years of past service, and contributions are tax deductible for the employer. Where this is the case, the employer contributions for this past service could be significant. IPPs have a 2% rate of accrual, with a defined benefit limit for 2019 of $3,025.56. Someone with compensation of $151,278 (of which 2% is $3,025.56) will have accrued the maximum pension for 2019. If the earnings for the prior 28 years allowed for the maximum, the accrued annual pension as of Jan. 1, 2019 would be $84,715.68. CPP (and possibly OAS) bridge benefits could be provided as well. Adding to the IPP’s attractiveness, all pension benefits can be indexed to CPI. Virtually all IPPs established in 1991 had only a defined benefit (DB) provision, while most implemented in recent years have a defined contribution (DC) provision to accommodate younger family members (typically below age 40) where the DC provision will provide for a larger annual contribution than the DB provision. If not, the plan text can easily be amended. The question that is increasingly being asked is whether having a hybrid plan with both DB and DC provisions can be used in other ways to provide value. The DC provision can be comprised of two accounts. For years when a member participates in the DC provision, total employer and employee contributions are capped at 18% of compensation, up to the money purchase limit ($27,230 for 2019). CRA will require minimum employer contributions of 1% of compensation (unless the DB provision has excess surplus). The IPP provisions dictate the amount of required employer/employee contributions. The DC provision can also have an additional voluntary contribution (AVC) account. Imagine Joe, whose pensionable earnings are $100,000. If, in the year in which he participated in the DC provision, the employer was required to contribute the minimum of $1,000 (1% of $100,000), Joe could choose to contribute up to $17,000 (17% of $100,000) to the AVC. However, this strategy would generally deliver less than a DB provision for members aged 38 and older. Implementing an IPP would generally not be appropriate if the employer doesn’t want to provide a significant DB pension to the eligible owner-manager, or anticipates being unable to do so. If the employer later wishes to provide a DB pension for the years in which the owner-manager was a member of the DC provision, a past-service pension adjustment will be needed, as well as an actuarial valuation report. Most IPPs include an AVC account, which allows investment management fees to be charged directly to the employer, rather than against the IPP’s assets. These investment management fees are tax-deductible to the employer, allowing for greater accumulation within the AVC account compared to an RRSP. The member could transfer RRSP assets—other than those that form part of the “qualifying transfer” required to fund past service under the DB provision—into the AVC account when implementing the IPP. In Table 1 we illustrate two case studies taking into account the significant deduction for terminal funding. The maximum funding valuation, which must be employed for designated plans, artificially caps contributions to the IPP. Terminal funding can occur once all plan members have started collecting a pension and the IPP has been de-designated. What if the individual had been in the RRSP system? Let’s see what rate of return (ROR) Janelle and Lionel would have had to achieve in their RRSP (net of fees) to arrive at the same Jan. 1, 2019 balance as their IPPs. The maximum RRSP room for someone contributing from Jan. 1, 1991 to Jan. 1, 2019 is $528,050, taking into account the maximum RRSP room of $27,230 for 2019. We looked at two scenarios. In the first, Janelle and Lionel made the maximum contribution to their RRSP every Jan. 1. In the second, they didn’t contribute in the earlier years and put in a flat amount of $52,805 every Jan. 1 from 2010 through 2019. If we look at the numbers in Table 2, we see that if Janelle had the means (and the discipline) to contribute the maximum to her RRSP every Jan. 1, she would have had to earn returns of 9.9% per annum (compared to 10.8% for Lionel) to match her IPP total. Contributions to RRSPs are often deferred. The good news since 1991 has been that RRSP contributions can be carried forward. Unfortunately, the amounts are not indexed. If Janelle and Lionel spent their earlier years investing in their businesses and only started contributing to RRSPs in their later years, the required rate of returns jump to 29.5% and 32.6%, respectively. In our current investment environment of low inflation and low bond yields, none of the annual returns in Table 2 are achievable over longer periods. This means there is real value in the DB provision. There could be some value in the DC provision, where provincial rules require minimum contributions, but these circumstances should be analyzed carefully. The DB provision will always provide a larger benefit than the DC provision. 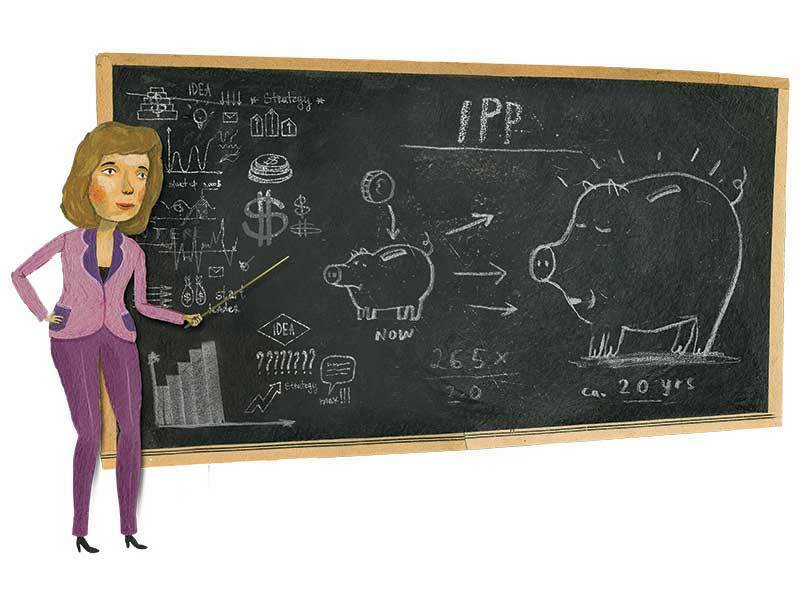 Clearly, the IPP is a powerful tax-planning and retirement tool. Lea Koiv, CPA, CMA, CA, CFP, TEP, is a tax, pension and retirement expert with Lea Koiv & Associates. Mark A. Lesniewski, FSA, FCIA, is president and CEO of LMC Group Inc.